We're right off of Route 66! At Richie's Real American Diner in Victorville, CA and Tony's Diner in Devore, CA, we are here to serve great food to our local communities and to anyone who walks through our doors! We take pride in offering great service, food, and most of all, a friendly smile. We're thrilled to be bringing back a great environment from America's past time and adapting it to our present. The original “American Diner” is legendary and we capture it perfectly! Although we have not been around since Route 66 first opened, we are on the original Route 66 delivering the same nostalgia and atmosphere of old school Route 66 dining! Come and visit us and see our famous smoker where we grill our delicious meats and our comforting homemade sides to go with them. Come step into a time warp and eat some serious 1950s comfort food with us! 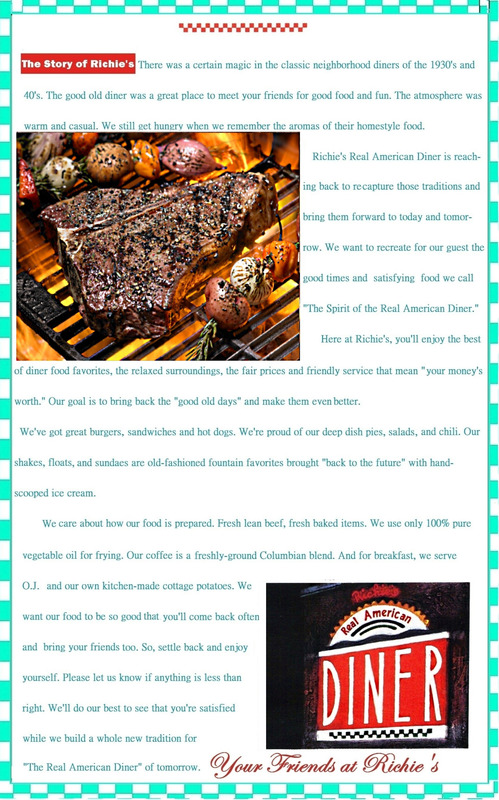 We feature a large menu and great 50s style ambience at Richie’s Diner offering you everything from traditional pancakes to our famous “Chicken on a Bun”. Our second location also delivers 1950s flair and food. Tony’s offers great BBQ and a fun filled Route 66 menu featuring items like daily specials and our all you can eat rib special. Richie’s menu surely delivers something for every foodie who stops by! Drop in, stretch your legs, and get a great meal after a long day of traveling on Route 66. Our menu items are endless. Check it out!